The semi finals are all done and dusted. The winners are looking forward to next weekend’s Finals Day and the losers are left pondering over what could have been. And once that dust settled the defending champions in the ‘A’, ‘B’ and U21 Cups are heading to Burnaby Lake this coming Saturday to defend their titles. Surrey United Firefighters are looking for the threepeat in the A Cup and a place once again at the nationals, whilst Richmond All Blacks are looking to cap off a great season that saw them win the Richmond Adult Soccer Association (RASA) League and Cup double, by bringing home the B Cup title for the second straight year. In the U21s, Guildford United hope to follow up their success in 2013. 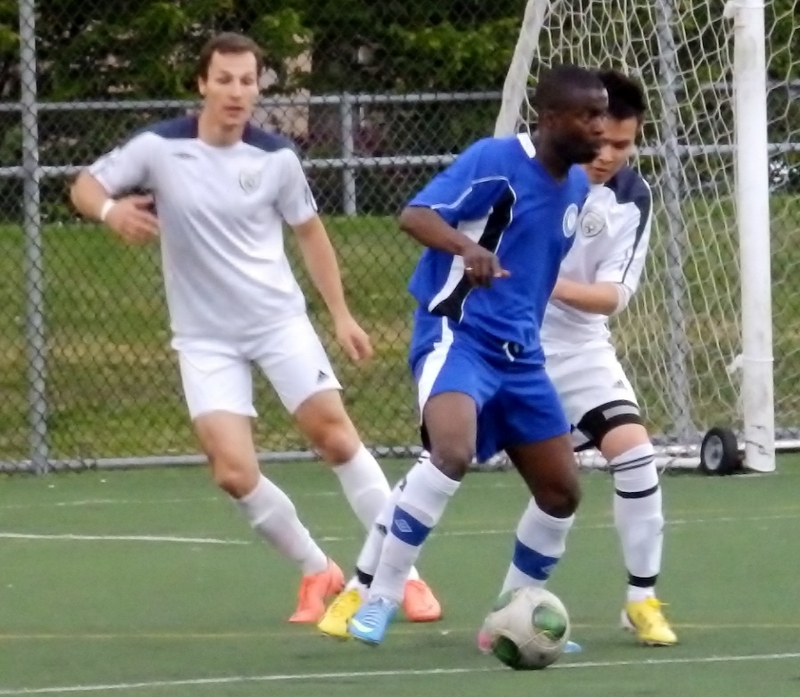 We’ve seen some great games in this year’s Provincial Cup but the Coquitlam Metro Ford Wolves – Surrey United Firefighters semi final won’t go down as one of them. Surrey have been made to work hard in every round of the competition so far this year and this game was no different, although it was a cagey affair from the start with both sides appearing to be avoiding making a costly mistake. It took 15 minutes for the first shot on target and the game had penalties written all over it from the early going and so it transpired. Sean Einarsson fired over for Surrey just past the midway point, as the Firefighters controlled possession without creating too many clear cut chances, although Coquitlam were looking a potentially dangerous side on their breaks if they could get some offence going. It was the Wolves who had the better chances in the second half with a shot flashing inches wide in the 69th minute. They came even closer with 12 minutes remaining when Andrew Veer rose above the Surrey defence to meet a corner but his header hit off the ground and into the arms of keeper Paul Shepherd. Surrey’s possession started to take effect as normal time came to a close and they had a couple of chances to win the game but couldn’t find the breakthrough. The game got a bit more lively in extra time with Adam Jones just failing to get on the end a dangerous cross into the box three minutes in for Coquitlam and Einarsson firing over from a position for Surrey six minutes later. The home side had the best chances to win the tie in the second period of extra time and Domenico Delli Santi should have done just that in the 109th minute when he was played in but Fink produced a point blank save to turn his shot off the left post. So scoreless after 120 minutes, the game headed to penalties. The first seven kicks were converted to give Surrey a 4-3 lead, with Nigel Marples, Tom Lowndes, Vinnie Stewart and Kyle Sohi doing the business for Surrey and Delli Santi, Andre Pietramala and Sang Hwang responding for Coquitlam. Luigi Polisi was next up for the Wolves but Shepherd went the right way and saved to his right, giving Einarsson the chance to send the defending champs through. The UBC player did just that, sending the keeper the wrong way. You can see video of some of the chances from the game and the full penalty shoot-out below. Surrey will now take on VMSL foes Croatia SC in Saturday final, as they aim to become the first side to win three straight Provincial Cup titles since Victoria West did the fourpeat from 1979 to 1982. Croatia got to the final by disposing of VMSL Imperial Cup winners Inter FC 1-0, in a closely contested match on Saturday afternoon. Former Whitecap Johnny Sulentic scored the winner with a late penalty in extra time. The ‘A’ Cup final will be the showcase event of Finals Day and will kick off on Field #3 at 3pm. Unfortunately our ‘follow the winner’ plan was thwarted in the B Cup due to a scheduling clash with the Caps game on Saturday. So instead, we took in Friday night’s semi final that saw Richmond Athletics at home to BMSA Champions, South Burnaby Fighting Irish. Although it was an even match for the most part, the Burnaby side ran out comfortable and deserved 2-0 winners in the end. Richmond were the better team in the opening exchanges, with Russell Neal’s pace looking like it was going to pose some problems for South Burnaby. It was a cagey affair, as both teams looked to sound each other out, but it was the Fighting Irish who opened the scoring on the 21 minute mark. Luke O’Sullivan sent in a great cross from the right and it was met at the back post by Saman Safari, whose bullet header gave keeper Verde Rios no chance in the Richmond goal. It was a good finish but Safari looked to have pushed down an Athletics defender on his way to meeting the ball but it went unnoticed by the referee. The visitors finished the half the stronger, with O’Sullivan having another couple of chances but he couldn’t add to South Burnaby’s tally. The visitors had the first chance of the second half two minutes in when Daniel Williams shot wide but Richmond hit back and Sonny Janda was played in three minutes later and wasted a good opportunity to tie things up. There was little goalmouth action after that but a spell of Burnaby pressure on the 70th minute mark saw them create a couple of chances and force Richmond keeper Rhys Verde Rios into a great diving save from a free kick. Williams had a couple of chances in the 84th minute to kill things off for Burnaby, forcing two saves out of Rios, but the Fighting Irish did eventually get their second with three minutes of the match remaining. South Burnaby captain O’Sullivan got on the end of a through ball, made space for himself and coolly slotted home into the bottom corner to send the Fighting Irish through to the final. You can see some brief highlights and (blurry!) footage of Burnaby’s second goal below. The BMSA champs will now take on the RASA champs in the final, as defending champions, and Richmond League and Challenge Cup winners, Richmond All Blacks head back to the B Cup final in fine form. The All Blacks claimed their spot in the final with a 2-0 win over VMSL side Metropolitan FC on Saturday afternoon. The battle of the champions will kick off at 1.30pm on Saturday on Field #1 and should be a cracking match with the Keith Millar Cup at stake. The Finals Day festivities will kick off early on Saturday with the U21 final between two VMSL sides – EDC FC Burnaby and Guildford FC – at 10.30am, also on Field #1. Guildford are the defending Doug Day Cup champions. The Mens’ Masters final, for the Deryl Hughes Cup, will kick off on Field #3 at noon and will be a battle between VMSL side PoCo Castilians and FVSL side North Delta SC Rangers. 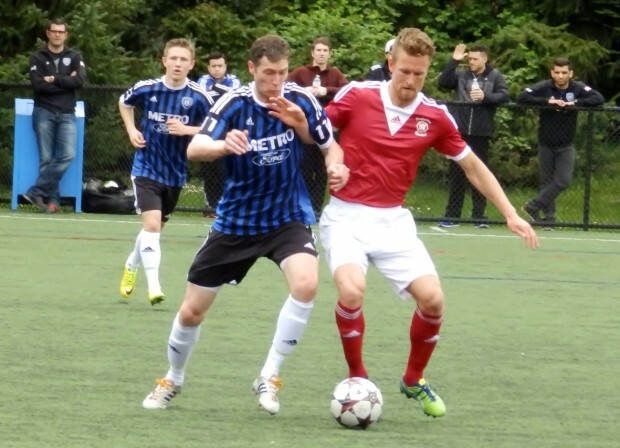 With the Whitecaps away in Columbus on Saturday, and with the sun expected to shine, it’s hoped that the Burnaby Lake West complex will see a great turnout for this year’s Provincial Cup Finals Day. If you’re free and fancy your live footy fix for the weekend, then get yourselves along there and support local soccer.